Proper mowing is essential for having a healthy lawn. One of the most common customer questions we have here in Bryan-College Station is about mowing. How to mow? When to mow? And how does the different grass type affect your mowing? Here are some tips and recommendations when it comes to mowing your grass this year. 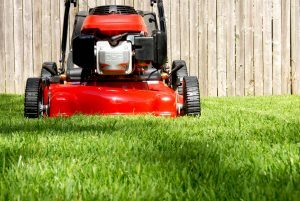 For the first mow of the season, usually around late March or early April, we recommend giving your lawn a “short mow”. This means you should lower your mower height to scalp the lawn and remove all of the dead and brown tissue. Bag clippings either with a bagging mower or by raking the lawn. This will help the lawn tremendously not only as it greens up, but all season. Do not rake St. Augustine aggressively! This will pull up the runners and damage the grass. Use the medium/middle mower height setting on your mower. Do not mow too short that scalps the lawn, but it’s important not to mow too tall either. There are some misconceptions about mowing St. Augustine as high as possible, which I highly discourage against. Mowing St. Augustine too tall encourages shallow roots, excessive thatch, and much higher disease susceptibility. A middle to just above middle setting on your mower that doesn’t scalp your lawn is recommended for St. Augustine. We often see customers raise the mower height gradually each summer until they can’t raise it anymore. The key is to keep mowing consistently every week at the same moderate height. We recommend mowing Zoysia at a moderately low to moderate level. This would be the middle setting, or even one lower on your mower. Zoysia lawns that are mowed high have weaker and shallower root systems and are more susceptible to winter damage. Bermuda should be mowed as low as possible, without too much scalping. If the ground is uneven (most lawns are), there will some scalping. Find a mower setting that minimizes the overall amount of areas that are scalped. Try changing directions, and most importantly, stay consistent with your mowing schedule. The lawn will scalp entirely if you go two weeks during the summer and cut low. It will take several days to green up again. Sharpen the mower blade at least once or twice a year. This is important in having a nice clean cut. 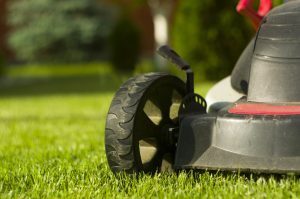 Dull mower blades can spread lawn diseases, and leave a brown appearance because the blades are torn, not cut cleanly. Always try and change mowing directions so the cut is even and no ruts form in your lawn from using the same mowing pattern. Don’t worry about bagging your clippings. Mulching your clippings help the health of your lawn. Stay consistent with weekly mowing. Waiting two weeks can make your lawn appear brown, stresses the grass, and increases disease occurrence. If your lawn goes 10 days or longer between mowing, my suggestion is to raise the mower height 1 level, then mow again a few days later back at the normal level. Try not to let the lawn get so tall you have to mow it on the highest setting for the rest of the year. Worse case, lower the setting back to the original setting in September. To learn more about our lawn care services please visit our Lawn Care Services Page or give us a call at (979) 272-6866.